The Hugger Mugger Para Rubber Mat is made from natural rubber like similar high end mats. Its best feature is its reliability. For those of you who don’t have yoga socks or yoga gloves, you know that the very worst thing is transitioning into downward dog and feeling your hands and feet slipping along the mat. No matter how much strength you put into your hands, you can’t help it. 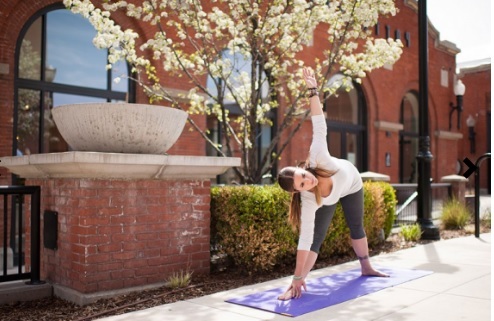 With this yoga mat, Hugger Mugger is providing you with a solution to your problem. Both sides are made from rubber, which is much easier to grip onto compared to other materials. Not only this, but both sides of the yoga mat are non-slip; so, they won’t be slipping away from you anytime soon. The grip of the mat will allow you to move perfectly from pose to pose; thereby, getting the most from your daily practise. The very design of the Hugger Mugger Para Rubber Mat makes it ideal for any yoga practitioner. With 1.4” thickness, you’re provided with a perfect balance between too thin and too thick. 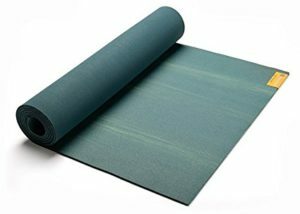 This yoga mat allows you to draw your strength from the ground beneath you, all the while keeping your body cushioned and comfortable. The only major setback with this yoga mat is that it’s six and a half pounds. Although it doesn’t seem like too much, the weight adds up when you have to walk around with it in your arms or strapped to your back. Otherwise, the only disadvantage to buying Hugger Mugger’s mat is that, because it’s made from rubber, it smells terribly when you take it out of the packaging. If you buy a bottle of a yoga mat cleanser, however, the smell will come off in no-time. If you don’t feel like investing the extra money, then simply ignore the smell when you practise and it will fade with time. While this weight is inconvenient, the pros of this mat definitely outweigh the cons.